Amma Ṭhanasanti is a California-born spiritual teacher dedicated to serving all beings. 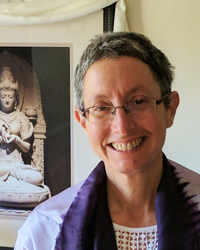 She has been committed to awakening since she first encountered the Dharma in 1979. As a former Buddhist nun of 26 years, she combines the precision and rigor of 20 years in the Ajahn Chah Forest Tradition, compassion, pure awareness practices and a passion for wholeness. Amma has been teaching intensive meditation retreats in North America, Europe, Australia and Asia since 1995. She invites an openness to pause and inquire into the truth of the present moment, integrating what is liberating at the core of our human condition with everyday life.